Tool Tips will only display on the vehicles that you specify, when your visitor’s cursor hovers over one of the specified vehicles. 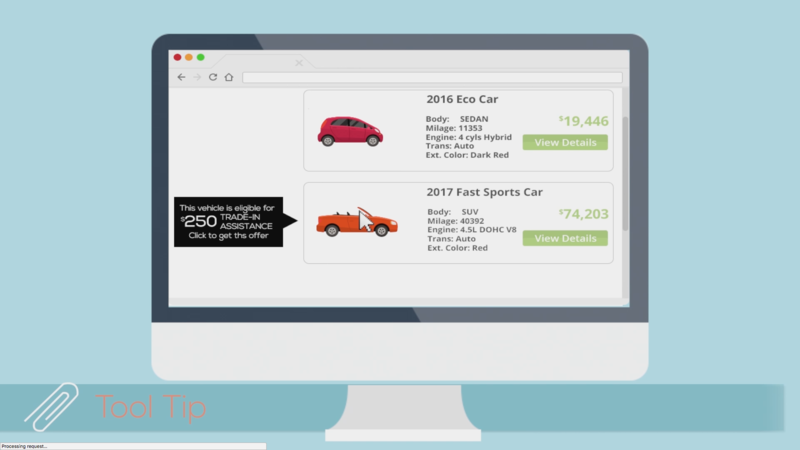 It is a form of auto inventory marketing, and is an incredibly quick way to provide customers with a highly relevant offer. We can also give the visitor the option to fill out a quick little survey to receive the offer, and get them to convert right then and there. These surveys also open doors for you to communicate with, and engage your customers while they are on your site. We are an automotive dealer digital marketing company, and we specialize in auto inventory marketing. Before you spend more money on traffic, let’s maximize the traffic you’re already getting. For more information on how you can use Dynamic Visitor Promotions to get more conversions and more leads, contact Dealerwebb or visit us at https://dealerwebb.com/promowebb-dvp/promotional-advertising.